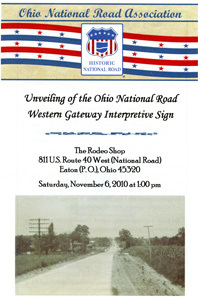 The twelfth Ohio National Road Interpretive sign was unveiled at The Rodeo Shop on November 6, 2010 commemorating the Western Gateway to the National Road in Ohio. 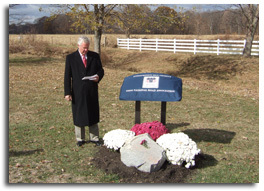 This site is located in Preble County at 811 U.S. Rt. 40 West, Eaton (P.O. ), OH 45320. Pictured is Preble County Commissioner (and ONRA Board member) David Wesler as he welcomed the attendees. 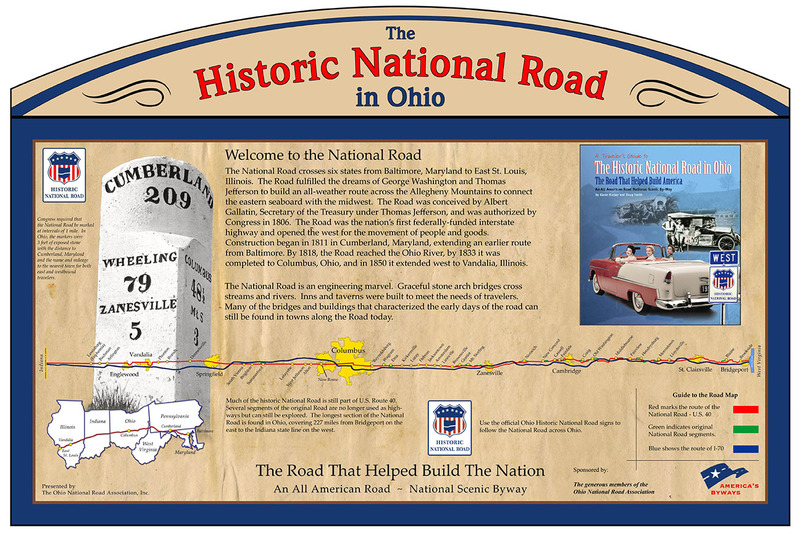 ONRA President Cyndie Gerken expressed her appreciation to all the individual donors and the Ohio National Road Interpretive Signage sponsors, like The Rodeo Shop, whose support has made this project a reality. 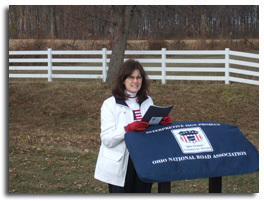 She also acknowledged ONRA’s Signage Committee for their hard work in making sure the signs are as interesting and accurate as possible. 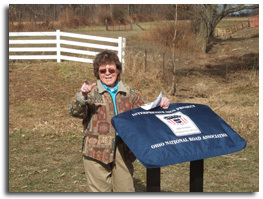 Rodeo Shop manager Kathy Hicks related the importance of the National Road and her pride in having this Interpretive Sign on their property. 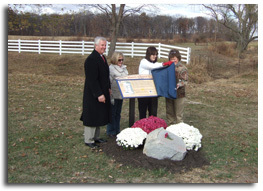 As a brisk breeze blew, the sign practically unveiled itself with a little help from (left to right) Commissioner Wesler, PCHS Director Jane Lightner, President Gerken, and Kathy Hicks. 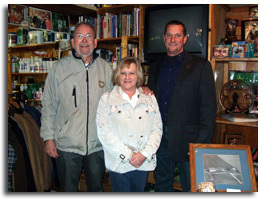 The Rodeo Shop employees and its owner braved the chilly air to participate in the unveiling ceremony. 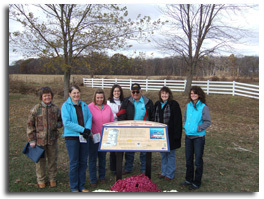 Pictured left to right are: Long-time store manager Kathy Hicks, Eileen Byrd (20-year employee), Wendy Bradham (18-year employee), ONRA President Cyndie Gerken, Rodeo Shop owner, Don Lutz, Melissa Lutz (16-year employee), and Emily Franklin (3-year employee). 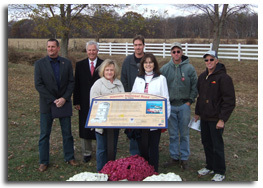 ONRA Board members were on hand to represent the Association. 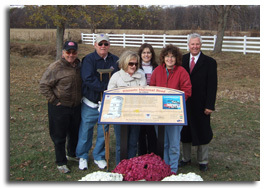 Pictured left to right are: Franklin County representative and Signage Committee Chair Mike Peppe, Montgomery County representative Paul Seibel, Preble County representative and PCHS Director Jane Lightner, Miami County representative and Board President Cyndie Gerken, Montgomery County representative Jan Brady, and Preble County representative and County Commissioner David Wesler. 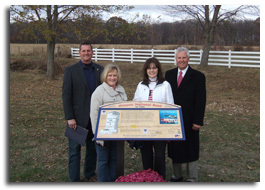 Preble County Commissioner Chris Day joined PCHS Director Jane Lightner, ONRA President Cyndie Gerken and County Commissioner David Wesler in recognition of the Western Gateway to Ohio’s portion of the historic National Road. 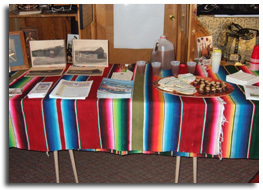 A reception followed the unveiling ceremony inside the amazing (and warm) Rodeo Shop. 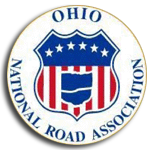 The ONRA information shared a table with Ohio-shaped cookies, Buckeye candies and apple cider. Preble County Historical Society Board members (left to right) Harold Bussell, Director Jane Lightner and Dave Wesler had the sense to come in out of the cold to enjoy the reception.